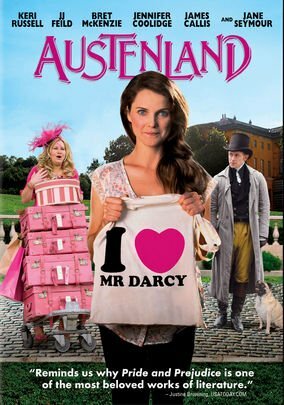 I want to go to Austen Land! So, this is what I saw the other night. Thanks to my friends on my Facebook page who recommended this to me! I love anything Jane Austen-ish and this movie was adorable. Plus, I love Keri Russell and OMG, Jennifer Coolidge deserves her own show. Or her own movie. Or her own something, because she’s just too damn funny. The premise is hysterical. Jane (as played by Keri Russell) is obsessed by all things Jane Austen, especially, Pride and Prejudice. She’s searched her whole life for a real live Mr. Darcy only to be stuck with the Mr. Wickhams and Mr. Collins’s of the world. So she takes her life savings and flies to England to spend a week at a theme park called Austen Land, where you get to experience life as Lizzy and Emma and all of Jane’s heroines did. Watching this movie makes me want to write a screenplay from my novel THE BOYFRIEND OF THE MONTH CLUB. When the novel came out I received a lot of film interest, but ultimately, no buys. One day, I think I’ll do it. Just gotta get the current project done first! ← Previous Previous post: Have a Happy Memorial Day weekend! Next → Next post: How important is your setting? Thanks for the recommendation. I always love the book better than the movie, so off I go in search!